Objective: Legends of Honor is a new MMO action strategy game by Goodgame Studios. Explore the worldmap with your hero and experience action packed battles. Build up your castle and recruit a mighty army. Join forces with other players in an alliance and conquer the world of Legends of Honor. 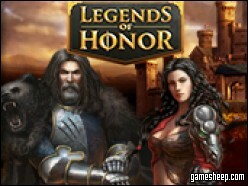 We are glad that you have chosen to play Legends Of Honor on GameSheep.com, the most dynamic website available. If you like this game Legends Of Honor don't forget to rate it and this way you will help with selecting only the best games for the home page.